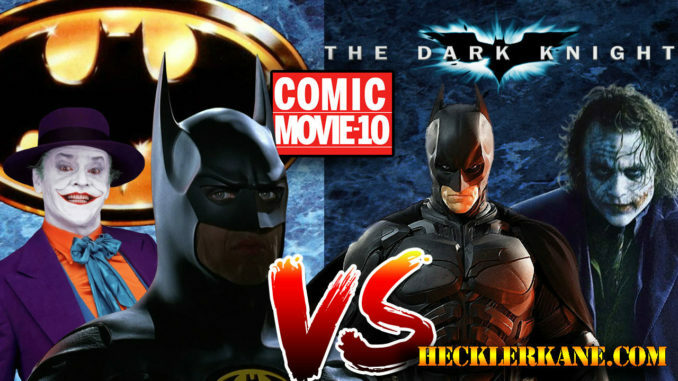 In this episode of Comic Movie – 10, the Kane brothers discuss the similarities and differences of the iconic films, Batman (1989), and The Dark Knight (2008). They focus not just on the classic comparison of the two Jokers but on the structure, as well as the diverse approach of each Batman. What Did The Dark Knight Steal From Tim Burton’s Batman? Joe and Dan point out that there were parallel key moments in both movies raising the question as to whether Christopher Nolan looked back to the Tim Burton version and included these significant events in The Dark Knight. It seems it would have been impossible to ignore Burton’s rendition since it was the most successful Batman movie as of 1989. Some of the key points include the kidnapping of Batman’s love interest in both instances and Batman’s mission to save her from the psychotic clown. Vicky Vale was abducted from the museum and Rachel Dawes from the party. This is where Batman and the Joker, in both movies, come face to face. According to Dan, there may be no greater adversity between hero and villain in all of comic book and movie storyline. Another common point in the two movies is the climax that occurs in the street, where each Joker displays his antisocial malevolence. Joe and Dan go on to point out the differences in each Batman. The Michael Keaton Batman, wanted revenge for the murder of his parents. The Christian Bale Batman, wanted to save Rachel Dawes, Harvey Dent and Gotham City. He was clearly the more moral character. In Batman (1989), he states that he will kill the Joker and does. In both films the villain is left dangling from a grappling hook. It is not the intention of The Dark Knight to kill, despite the outcome. In the end, Batman (1989) is the revered hero. He kills the villain, gets the girl and saves the day. In the Dark Knight he loses the girl, fails Harvey Dent, who becomes two-face. Batman (2008) ends up on the wrong side of the law regardless of having saved the soul of Gotham. Joe sees him as more truly the hero. Do you agree or disagree with Joe and Dan? How do you think the two movies compare? Leave your questions, comments, opinions, and as always, tune in for the next episode of Comic Movie-10.